Here we are at the fall season once again, when the art world is in full swing. If your travel plans take you to any of these major cities this season, you might enjoy making time to see one of these world-class art shows. The sixteenth edition of Frieze London takes place October 5–7, 2018, with two Preview Days on Wednesday and Thursday, October 3–4. The event will showcase the best of international contemporary art, with a discerning selection of around 160 galleries presenting their most forward-thinking artists. New collaborations with international curators, institutions and galleries will respond to contemporary issues and create an exceptional environment for creativity and discovery. This year’s themed gallery section, “Social Work,” features women artists—from Nancy Spero in the US to Ipek Duben in Turkey—who challenged the status quo and explored the possibilities of political activism in their art-making during the 1980s and 1990s. La Foire internationale d’art contemporain (FIAC) opens at the Grand Palais October 18–21, 2018. The 45th edition of this show welcomes 195 galleries, including eighteen new participants from around the world, showing modern and contemporary works, beginning with early-twentieth-century masters and extending to today’s emerging artists. Concurrently, FIAC Hors les Murs presents a variety of outdoor exhibits around Paris, including an installation of twenty works at the Tuileries garden, arranged in collaboration with the Louvre museum. This show returns to the Park Avenue Armory October 27–31 with a focus on fine art and decorative art from before 1920, including antiquities. The third edition of this fair, launched in October 2016, has drawn ninety-three exhibitors, including ten new participants. 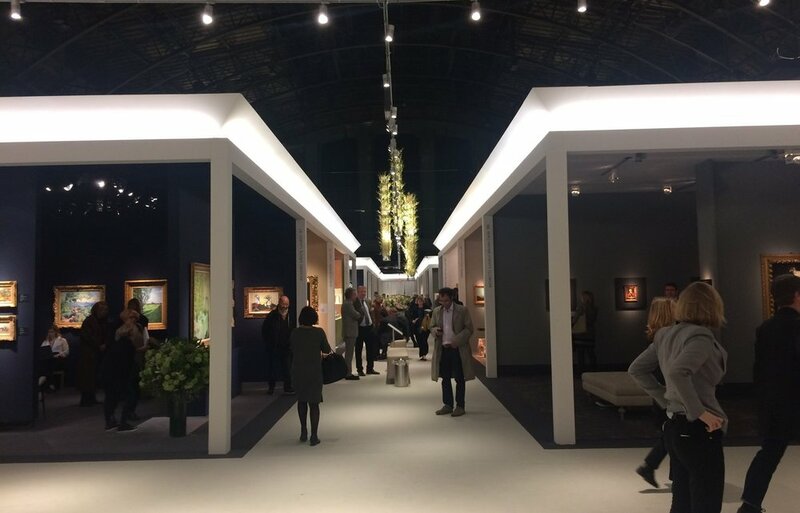 Before the fair, every object intended for display is professionally vetted by TEFAF’s committees of experts in twenty-nine categories. They study each artwork, review provenance, and verify attribution to ensure the quality of the exhibits. The American edition of Art Basel, the granddaddy of all art fairs, takes place December 6–9, 2018, at the Miami Beach Convention Center. There, 250 of the world’s leading galleries will show artworks from around the globe. The event draws 70,000 visitors each year by offering an exciting week packed with shows, events and a plethora of satellite fairs around the city.